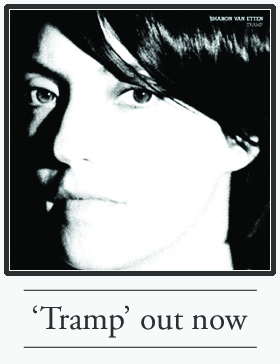 Sharon Van Etten’s marvelous third album Tramp opens with jangling bells and displaced pulled fuzz from panged guitar plucks. Van Etten’s voice comes into view. It saws up and down a ladder of needle-worked indifference and culminates to a pooling lacquer. “Warsaw” reveals her voice’s particular talent to ever-unfold as the song paces to the fragile wilt of sober obsession while begging, “I want to show you.” And if there is one thing that Sharon Van Etten never presumes to know how to do, it is to show anyone anything. But she always seems to do it. Tramp showcases Van Etten’s craftsmanship with words and her genius of delivery. “Give Out” filigrees the simple beauty in finding someone to trust as Van Etten narrates, “I loosen my grip from my palm, put it on your knee, in my way, I say you’re the reason why I’ll move to the city or why I’ll need to leave.” With the folk-rock snarl of “Serpents,” she recounts a reckless lover who enjoys “sssucking on drinks.” As the tracks on Tramp unfold, Van Etten cups words with her mouth that flow slowly and decidedly revealing a delicate, meditated release of spindled introspection. With “In Line,” Van Etten explores the burdensome waters of waiting for love as haunting, layered vocals moan in chorus behind her and cymbals softly and steadily touch. 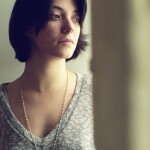 The tension peaks and Van Etten’s emotion is nearly tactile as she squeezes the last bit of lemon out of the phrase “in line” again and again through a gradient of dense percussion. It is almost startling how far she can reach with her voice—any sense of sadness is nearly pacified by what she has done with it. At times on Tramp, Van Etten sings with the vigor of someone who is discovering her voice for the first time. Producer Aaron Dessner of The National constructs an expansive frame out of glassy hair-line cracked ambience enshrouding Van Etten’s pithy backdoor way with the latticed elegance that it deserves. Beirut’s Zach Condon’s trumpeted cadence meets Van Etten’s swirling drawl splendidly in “We Are Fine.” “Magic Chords” rests closely to the microphone in railroad era snap-jazz and one could seriously consider doing a slow, deadpan version of the can-can to it. The buoyant “All I Can” climbs and steadily transcends Van Etten’s assertion that her “memory steals every moment [she] can feel.” This is someone haunted by the past, but the instrumentation, transitioning in four tiers from stripped-down to full-bodied, seems to prevent the past from getting to Van Etten here. As she cries, “we all make mistakes,” it’s as if she is finally forgiving herself for bits of life that have caused casualty to parts of her heart. As the song builds, it is clear that this anthem is actually a portrait of bringing these parts back to life. And if there was any question, horns come in. And it’s glorious. On Tramp, Van Etten reveals her gentle way of bestilling the sonic air around her, while still reserving everything for the right moment. And the right moments, like her merciless memory, do not rest.